You are running your dental practice and have invested in the latest technology and software to provide your patients with quality dental care. But you and your office are still frustrated because you’re stuck working with your dental laboratory the same painful old way. You fill out paper prescription forms that are inefficient and confusing. You don’t know the status of your case or when it will arrive. You play phone tag and have miscommunications over the phone. All of this pain costs you time, money and hurts your relationship with your dental laboratory. This served as an opportunity for Silicon Valley startup, Arklign Inc., who was founded by a Silicon Valley engineer, Ray Alde, and experienced lab owner, Rex Ho. “Our mission is to transform the dental lab experience and eliminate the pain that dentist offices and laboratories face with each other,” said Ray Alde, CEO of Arklign. 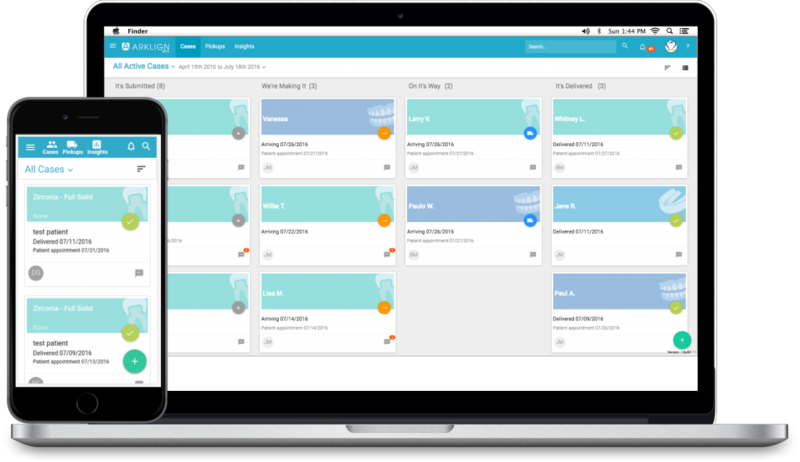 Arklign launched a case relationship management platform that unifies case submissions with communications, streamline case workflow and identifies meaningful actions with your dental laboratory. You can eliminate prescription errors with our smart digital prescription form and submit your case in less than 30 seconds. Prevent miscommunications with organized messaging for each case. No longer will your case communications be lost in your email inbox. Automatically receive case status notifications so you are always aware of your case progress. Schedule a pickup with just two clicks and be alerted when the driver is on their way. Once your case is submitted, your dedicated customer relationship manager will monitor your case to make sure your case is fabricated the way you want it. Your case will go through our state-of-the-art fabrication line and rigorous multistage quality control process so you can expect consistency every time. With Arklign Case Relationship Management, you will have access to actionable insights to help you save time, cost, and improve your practice and laboratory relationship. For more information, contact your Account Relationship Manager or register here.